"G.A.R. ~ 1861-1865 ~ (GAR Badge) ~ W.R.C." 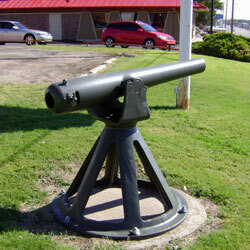 Description: 3-Inch Ordnance Rifle, converted to breechloader, mounted on a pivoting metal salute base. 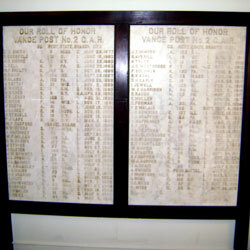 Description: The museum has two marble plaques, containing the Roll of Honor for Vance Post No. 2 of the G.A.R. When seen (November, 2006), these were on display in the main room of the museum. 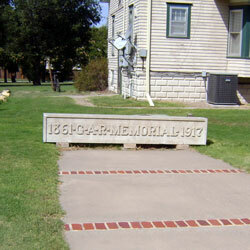 Description: Located behind the museum is a large cornice piece labeled: "1861-G-A-R-Memorial-1917". According to the Museum Curator, this was originally part of a building that was replaced by the old City Hall which has also been demolished. 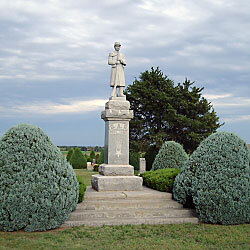 Description: A set of granite spires flank a flagpole. The central inscription reads: "In Memory Of All ~ Who Served Their Country ~ In Time Of Need". "Dedicated May 30, 1988". 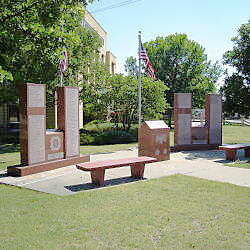 Side inscriptions record the names of those who served in World War I, World War II, Korean Conflict, Viet Nam. 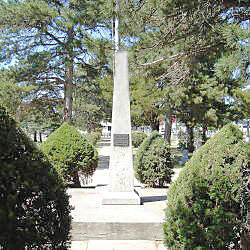 Description: A granite spire is mounted in a central area of the cemetery. The inscription reads "In Memory Of Our War Dead ~ Dedicated May 30, 1949 ~ Casper J. Middlekauff ~ Post No 173 ~ The American Legion" There is also a bronze American Legion star medallion mounted on the spire.